The Coromandel is an outdoor haven renowned for its stunning natural beauty and laid back culture. With some of New Zealand's best weather the Coromandel is a year round destination for visitors. Access to Coromandel town is via the beautiful coast road or ferry directly from Auckland. Spend your time walking, cycling, swimming or just relaxing in this beautiful natural landscape. 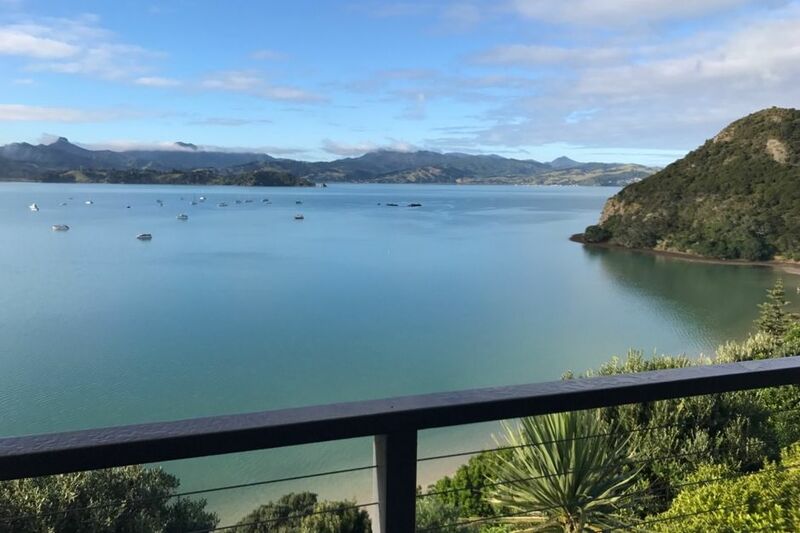 Situated in stunning Wyuna Bay Sea La Vie is a modern well equipped waterfront Bach with 180 degree uninterrupted views of the Coromandel harbour right through to Te Kouma Bay. The Ranges feature as a backdrop to the harbour and provide spectacular sunrises right across the water. At the end of the day stroll across the road and take a seat on Sunset Bench to enjoy the breath taking sunsets of the Hauraki Gulf. Double stacker ranch sliders lead to the deck which is perfect for that afternoon BBQ. Meander down the boardwalk-style and shell steps directly to Wyuna Bay beach below for a swim, or take the 2 kayaks for a paddle. Single internal access garage with extra parking on the concreted drive and off road gravel parking for a car and boat trailer at the top of the house (this is slightly slopping and parking is at your own risk). Visiting Sea La Vie you will create lasting memories to share with family and friends. Deck not suitable for unsupervised small children. Extras: Cleaning (Required, NZ$60.00 per stay), Linen traditionally provided by guest (sheets, pillow cases, towels, tea towels), We can provide Linen if required, NZ$15.00 per person, this must be requested and cost added to booking request. We spent 10 blissful nights staying in Coromandel. Loved the house, view and local community. Lisa was very responsive to our questions and helpful during our stay. The house accommodated 6 people comfortably. We really enjoyed taking the kayaks out, paddling around the shoreline. There is a full kitchen with lots of appliances. We easily prepared breakfast, lunch and dinner in the house. It was a great place for a long term stay. We loved our stay! Amazing view and cute place. Host was wonderful! We had a wonderful time at Sea La Vie! It's a great bach in a wonderful location, very cosy and well equipped with everything we needed for our stay! It was a long trip from Germany, but hope to come back soon! We had a great time. Loved the path down to Wyuna Bay. House was very comfortable and views were captivating. Host was excellent to deal with, really friendly and helpful.